North Haven is the perfect environment to raise sheep and goats. 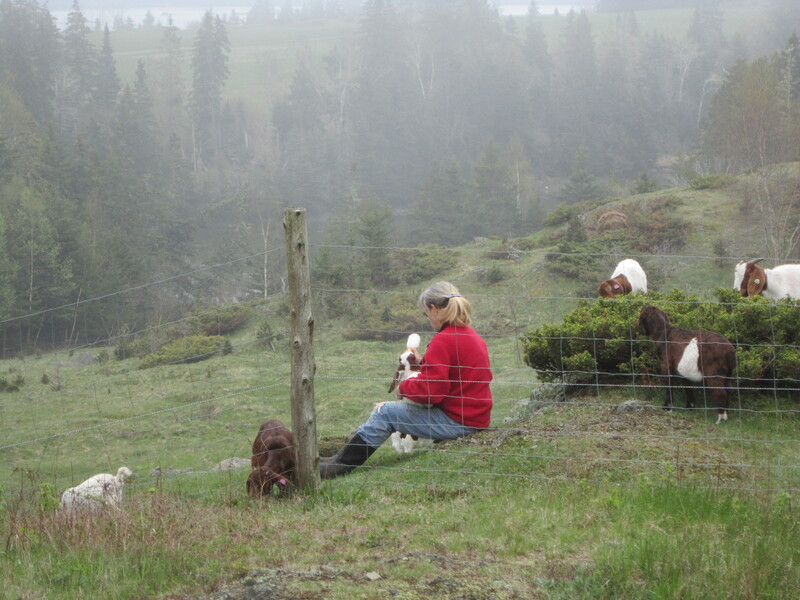 They have access to pasture, browse, plenty of fresh water and a view of the ocean. Grain is supplemented to give them a balanced diet but most of their food comes from our beautiful island surroundings. 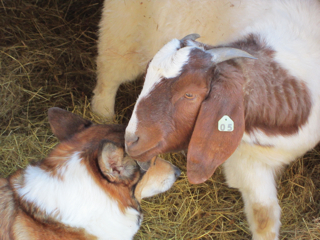 Our sheep and goats are treated with love and kindness from the moment they are born. We are with them during birth. If the temperature is chilly our newborn kids are adorned with hand knit sweaters until the air turns warmer. A newly renovated barn and other shelters keep them from exposure to harsh weather. We cut our own hay on family owned and neighboring pastures. Because we believe in keeping our animals healthy we treat with antibiotics only when necessary. We are not an organic farm but our animals are raised naturally. They do not receive hormones of any kind. Our animals maintain a healthy and productive life and the customer receives a wholesome product. 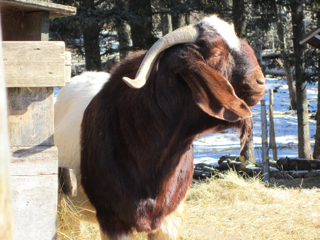 Boer Goats are the quintessential meat goat. Both sexes are long, large framed, and massively muscled. Most are white with a red or brown head and some are red or painted. We have several beautiful red goats. Mature bucks can weigh 250-350 pounds; does, 150-250 pounds. Our Boers are good natured and docile. They are prolific, twins are the norm, but triplets are common. They are excellent mothers and have plenty of milk for their kids. Our new buck, Tunga, was a show goat. We purchased him in 2011. His kids are strong and growing quickly. Goat meat (Chevon) is 50-60% lower in fat than beef. It contains 40% less saturated fat than skinless chicken according to the USDA, and is lower in cholesterol than venison and rabbit. It is a wonderful homegrown red meat. The molecular structure of goat meat is different than that of other meat and digests more easily. It has a finer texture and milder flavor than beef. It has a taste of lamb and beef combined but is a bit gamier. Chevon is not fast food. It is lower in fat, and is not marbled. Chops and steaks can be pan-fried, grilled, barbecued or oven baked. Stew meat and burger can be substituted for any lamb or beef recipe. Legs, roasts, kidneys, sausages, and liver are also available at our farm. Katahdin Sheep were developed in the 1950’s by Michael Piel in Abbott, Maine. He was looking for an adaptable meat sheep that would not need shearing and would graze power lines. Mr. Piel was a sheep enthusiast and a geneticist. 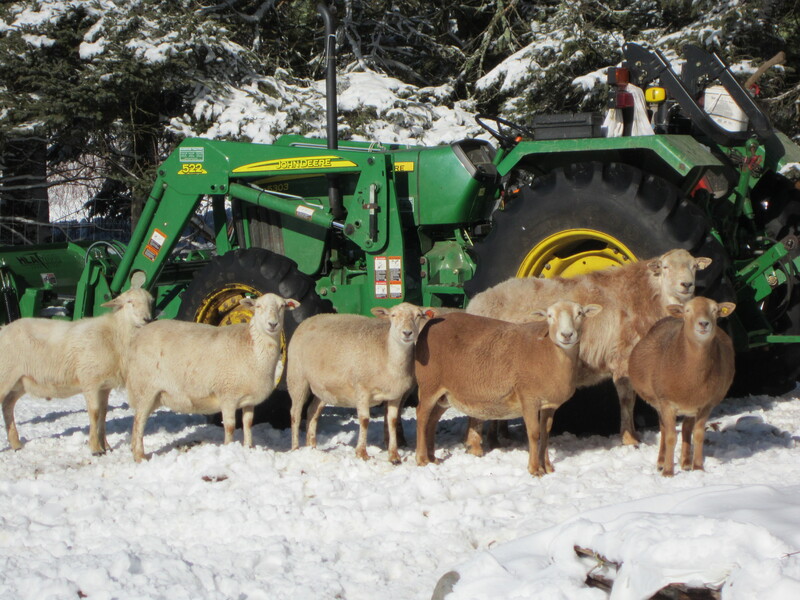 He bred hardy St. Croix sheep with Sufflolks and after twenty years of cross breeding he selected 120 ewes and named them Katahdin after Maine’s Mt. Katahdin. Katahdins have strong maternal instincts and lambing is easy. They produce strong vigorous lambs and are parasite tolerant meaning less medication is necessary. Our pastures are perfect for grazing and as with the goats they enjoy browse. In the summer they shed their hair on the fences and trees, which must give birds warm fluffy nests. Their tails are not docked. Katahdins produce a mild lean tasty meat. Our goats and lambs are butchered, packaged and frozen at Curtis Custom Meats in Warren, Maine. We sell USDA inspected products at our home farm store. We offer several choices of sausage and mutton, as well as other delicious cuts. We welcome you to stop by year round. Our hours are from 10-4. If you do not see us then we probably are at the barn. We also sell live animals for your own enjoyment or for slaughter. Whole, or sides, of lamb and goats can be butchered by custom order. We are sorry that we can not ship frozen products. You may call 207-867-4625 or email us: spcdbc@gmail.com to make an appointment if desired. We hope to see you soon. Quacking amongst the sheep and goats are twelve Khaki Campbell ducks. In the spring of 2011 we place three eggs under our broody Bantam and she successfully hatched two. Ten more eggs were hatched in our incubator. 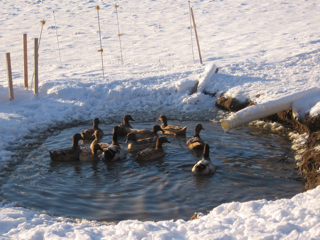 Today we have 10 ducks and 2 drakes. We love eating our eggs. They are extraordinary for baking, pickling, and making frozen custard ice cream. It is fun making different flavors of rich creamy ice cream. Growing up Sam and I were both exposed to farming. Our families raised sheep, pigs and cattle. In 1974 we married and decided that our future children would benefit from the same values that we enjoyed. During the 1970’s and 80’s we raised Herefords, chickens, pheasants, ducks and rabbits. Our children helped with the chores and making hay. Our garden has always produced enough to preserve for the winter. 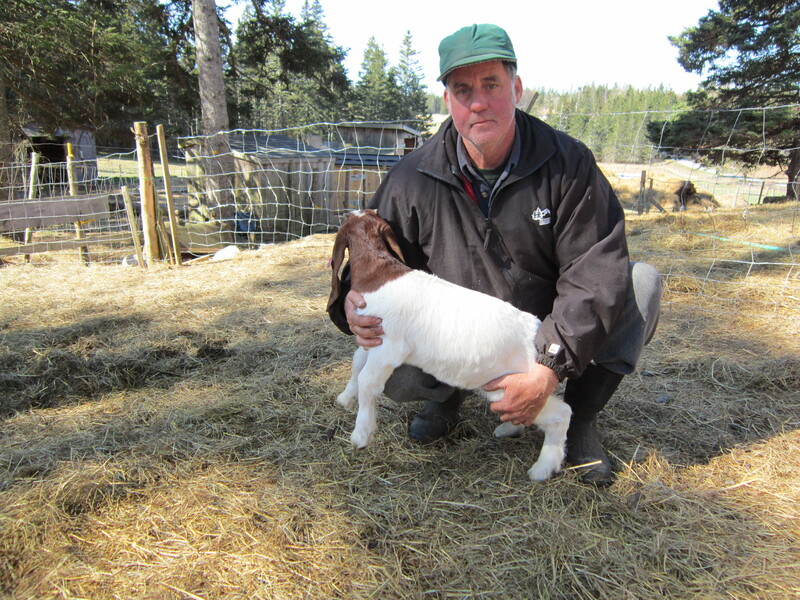 In the fall of 2007 we purchased our first sheep and in the spring of 2008 we began raising goats. As our grandchildren began arriving we knew it would be important for them to enjoy the same lifestyle their parents had. They enjoy petting the animals, helping with chores, and often are present for the birthing experience. When not busy farming, Doreen enjoys painting with watercolors and crafting. A variety of note cards and three children’s books depicting art and photos are for sale at our farm. You can buy our children’s books online at Blurb.com. We are always thinking of new products to sell. This year we will have some Foggy Meadows Farm tee shirts and a new cook book available. We also have a few laying hens, a cat named Bella and our beloved Corgi, Flossie. She goes with us everywhere and sometimes is helpful herding animals. We hope to see you at our farm.